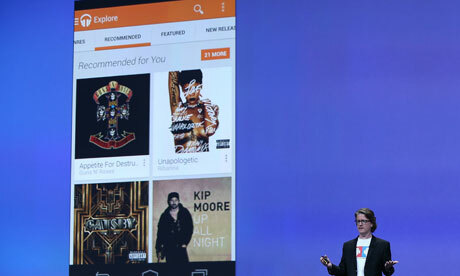 Straight from Google I/O, Google’s streaming music service has just been announced to allow people to listen to music for a monthly-subscription on their computer and Android device, much like Spotify and Rdio. Google’s streaming music service will cost $9.99 per month after an initial 30 day free trial and will be available in the US to begin with before launching in other countries. Users who sign up by 30th June, however, will get a reduced price of $7.99 a per month. “This is radio without rules. It’s as ‘leanback’ as you want to, or as interactive as you want to,” said Yerga. Users will be able to search for an artist and add tracks to their library. A “listen now” feature will create a mix of favourite artists or genres based on previously listened to songs. Google has managed to sign licensing deals with a variety of music companies including Sony, Universal and Warner, meaning millions of songs will be available in the catalogue when Google’s streaming music service launches on Wednesday. Whilst Google currently offers their Music service on the Play Store to purchase songs, as well as Google Music to store your songs in the cloud, this relies on you already owning the song. Google’s streaming music service allows for a user to listen to any song, as many as they like, for a monthly subscription, but you don’t actually own the song. The announcement comes as Apple have been rumoured to be in talks with the labels to launch their own subscription-based music streaming service, but are yet to agree a price. It seems Google have gotten in there first and now will go into direct competition with the likes of Spotify and Rdio. Are you excited about Google’s streaming music service, or is it just another service to consume your money to listen to music? Leave us a comment below with your thoughts.